This post is part of an ongoing series describing effective Facebook profile marketing strategy for business people. View the other posts in the series for additional strategies and tips. If you have a Facebook profile (and 1 Billion people do), your profile can be found by people who are looking for it. This is true whether you view Facebook as the best business networking opportunity on the planet or see it is the devil’s spawn that you use only to eavesdrop on family photos. This is also true if you lock down your profile using privacy controls - your profile can still be found and partially viewed (your name, avatar, and cover photo are always public). If someone is seeking you out on Facebook, they 1) probably know you, 2) have been referred to you, or 3) share a mutual friend. Any sales professional ('ahem REALTORS) can see that this kind of connection or interest is better than a cold lead. You are missing a golden opportunity if your Facebook profile doesn’t communicate your profession and set a positive impression, even if you never accept a friend request from a profile visitor. The reality is, people are checking you out on Facebook, and heat map studies confirm that your work information is an important part of what they investigate and view. So is your profile working for you, or against you? Although there are many details that interact to craft a Facebook profile that supports your brand (view all our Facebook profile marketing tips), this post addresses the top mistake that sales professionals make on Facebook and shows you how to correct it. But in order to address the #1 mistake, it is important to understand the following functionality of Facebook profiles. When you add a job to your profile in the “About > Work & Education” section of your profile, the employer information will hyperlink to a page in Facebook. It is not an option to have it link to your website, or to not be a hyperlink at all. It WILL link to a Facebook page. This is just how Facebook works. Additionally, Facebook has a feature called a hovercard which results in a business card size "pop-up preview” of the linked page appearing when a visitor rolls their cursor over your employer name. This means, that when someone looks at your profile and they view your About information (subject to your privacy settings - see item #4 in the tutorial below), they can hover or click the name of your employer, and it will preview or take them to a Facebook page (see for yourself, go test it out!). So the question is, what does that person see when they click on that link? Ideally, when they click the link to your employing brand they will learn more about the company you work for. They would see an established business page that has an attractive cover photo, additional information about the company, an established fan base, and recent activity on the page. This would be the best way for a visitor or Facebook friend to understand, in an instant, more about your job role and perceive you as a professional. In all cases above, you are left with a positive brand impression, as well as additional information about the employment of that person. You can view details about the company the individual works for, and ultimately get to the public website of the employer. As a visitor, you are clear that they work for a current, established company that has an effective Facebook presence. You also don’t question the employment of the person whose profile you are viewing. 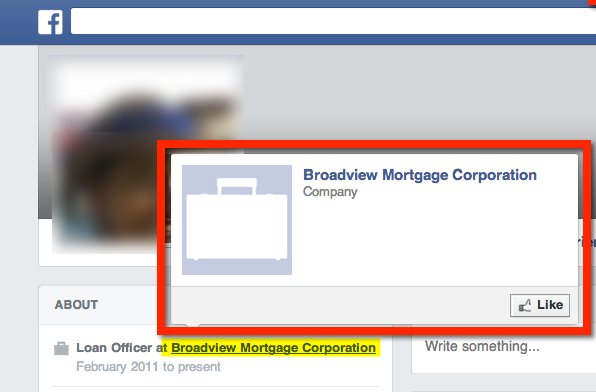 In this example, the Facebook use has failed to properly link to the official business page of their employer (or real estate brokerage) when entering the company they work for. As a result, Facebook automatically created a link to a blank Facebook page representing the employer that the person typed in their profile. This blank page essentially offers little to no additional information (or “social proof”) of the persons employing brand and fails to enhance the professionalism of their profile. This Facebook faux-pax is amplified when you consider the hovercard feature. This function makes the visitor experience of viewing a brilliant, or blank, business page even faster and more likely. Once again, if your profile is linked to a blank page, you have missed an important branding opportunity. So, what has happened? Why the difference? Are you helping, or hurting your brand building case in this section of your Facebook profile? Those of you who are guilty of linking to an auto-generated blank Facebook business page for your employer from your profile of this must fix it! The following tutorial shows you how. For this tutorial, I’m going to assume I am an agent at Berkshire Hathaway HomeServices California Properties and want to reflect that in my profile. Step 1: Find and LIKE the Facebook business page you want to link to in the work and education section of your profile. It is also helpful to note the 1) exact name of the page and the 2) page image/avatar. These two piece of information will help ensure you connect to the proper page in step #4. Step 2: Go to the About tab of your profile and click Edit in the Work and Education Section. Step 3: Start typing the name of your employer in the "Where have you worked?" box. Make sure that you type EXACTLY the name of the page you are trying to link to. So, if the name of your company is Berkshire Hathaway HomeServices California but the page name is BHHS California Properties, type BHHS California Properties. Step 4: When you see the name of the page you want to link to, select it from the pull down menu (Facebook will populate the pull down menu with pages that it finds that match what you type). By selecting the page from the pull down menu, Facebook will create a link to that page. Be sure you are picking the page from the pull down menu that has the proper name and avatar (noted in step #1) for the official page you are linking to. Note that if you don’t see the page you are trying to link to in the pull down menu, DON’T select the name that you are typing in the box that will appear in the grey bar at the bottom of the list. This is how a blank page gets created. Step 5: After you pick the page you want to link to from the pull down menu, fill in the rest of the information Facebook prompts you for. VERY IMPORTANT DETAIL: Be sure that the visibility of your employment is set to Public. This way, even non-Facebook friends can view the business page of your brokerage or employer and get a strong professional impression of you. This information is publicly available on your brokers or employers website, so why not make it visible on Facebook? Step 6: Click the "Add Job” button and a link to the proper page will now appear in the Work and Education area of your profile. Step 7: Test the link. View your profile and hover over the link that appears in your Work and Education section of your profile. Does it click through to the official page of your brokerage or employer? If so, great. You’ve maximized your branding and professionalism on Facebook in this area. If not, start again. You’ll need to delete the incorrect employer entry (Facebook doesn’t let you just update the link) and add a new employer. Think you've got it down? Leave a comment with a link to your profile, and share this great tip with your sales team!